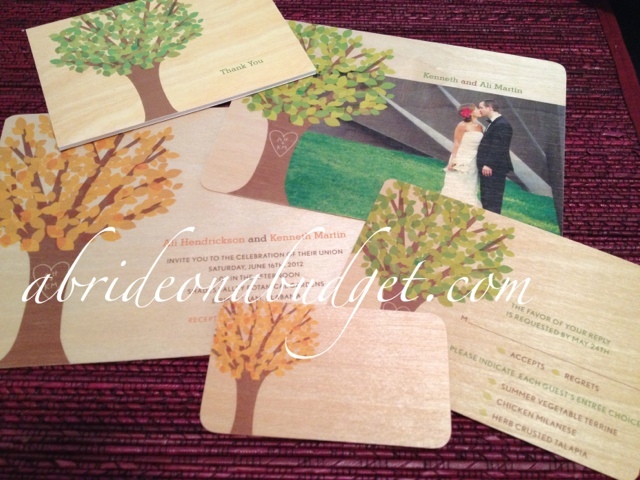 A Bride On A Budget was provided these cards for this review. All thoughts and opinions belong to ABOAB. I went to a wedding last weekend and the table cards were so cute. 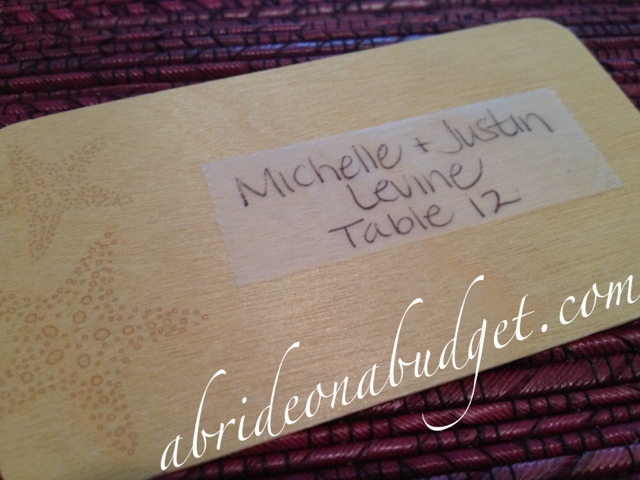 They had leaves cut from card stock and each person's name and table number on them. The leaves were a variety of colors and were either on a table or hung on strings with mini clothespins. So cute. That's the kind of stuff that really makes a difference at your wedding. All the small details add up. Night Owl Paper Goods has an easy way to bring small details into your wedding. At Night Owl Paper Goods, you can order a sample pack of the Wood Wedding Collection items, which arrives with a thank you card, invitation, RSVP card, and table card sample. The table cards are my favorite. There are a variety of images to choose from for the place cards. For me, personally, I was most excited about the starfish and sand dollar cards, since we are having a beach wedding. This small touch will make a huge difference. Plus, these are made of wood, which is sustainable, and it just makes me feel a lot better. If you know us, you know we try to reduce our carbon footprint as much as possible. And we try to incorporate bamboo into our lives because of its sustainability. Bamboo can grow at rates of 98 inches in 24 hours. So using it, it makes us feel better. So it's nice to incorporate this small bit of our lifestyle into our wedding.I mean, your wedding should be a reflection of you, after all. You can write directly onto the cards, but I prefer to affix something onto it. If you're looking to save a little, you can just use clear tape. If you have a few extra dollars, you can purchase clear address labels, print on them, and affix those to the cards. That's actually what we did when we used them. ... and stick it on a different card. Simple. My plan is to use these for our wedding and stand them in a mini sandbox. We could lay them out on their own, but they would do well standing up since they are quite thick. I'm planning on burying their bottomsin the sand so they stand, and organizing them alphabetically by last name rather than arbitrarily standing them up. Makes it a lot easier for people to find them. Plus, standing takes less room than laying flat. Night Owl Paper Goods makes a ton of items, including wedding cards. 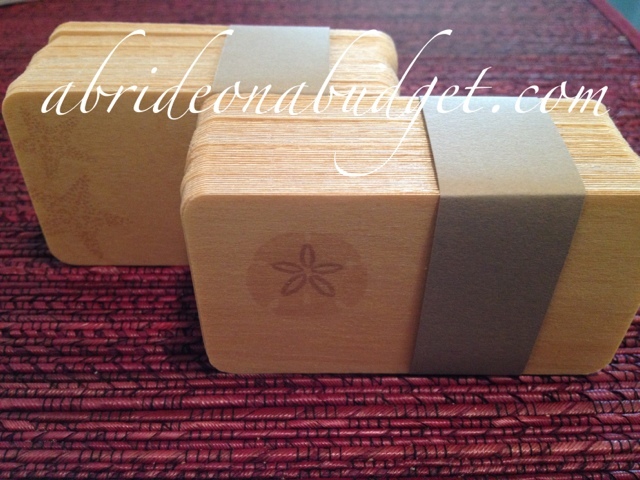 That wedding I referenced above, I actually gave them a wedding congratulations card from Night Owl Paper Goods. I want to give you a heads up about ordering, though. If you head to the site and look at the prices for the table cards, it says $1. However, that is an arbitrary price. The price starts at $3.95 if you order 25 cards and only drops to $1 if you order 200 cards. The price will drop again to $.69 if you order 1,000. Since the main page says $1, I thought they were all $1 no matter what, but that is not the case. I actually discussed this with Night Owl Paper Goods and the pricing was to be removed from the main page, but since it hasn't happened yet, I wanted to let you know so you are not shocked at checkout. 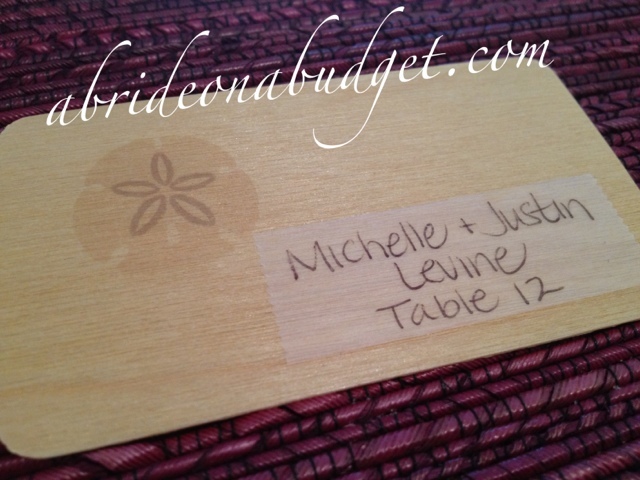 BRIDAL BABBLE: How are you planning on doing your place cards? Haven't figured out what we're doing for placecards yet. I've seen quite a few cute ideas on pinterest. We might go with tiny vases that hold a placecard and a single flower, mostly because we still have tons of those left over from my sister's wedding. But I also saw a cute idea recently where each placecard is actually a little box that holds candy. Kill two birds with one stone!